Does your client dry up when meeting people for the first time? For some people, making small talk with people they don't know is easy and they have a knack of making the conversation seem to naturally flow. Others might feel incredibly shy and just can't think of what to say - or if they know what they want to say don't have the nerve to actually say it. Shyness usually boils down to a lack of self-confidence and can be like an inner block that people just can't get past. Your client probably finds it easy to chat ten to the dozen with people they know well because their self-consciousness doesn't get in the way but may seek your help in being able to make small talk. 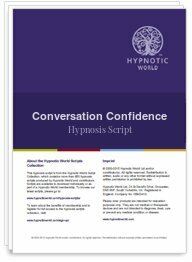 This Conversation Confidence hypnosis script can help your client to converse with complete strangers (if they want to) in a strong, self-assured manner and with a little practice and your help, of course, will soon become the life and soul of the party.